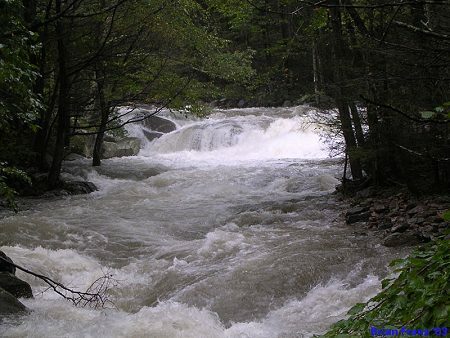 Hurricane Isabel swept through central Virginia on September 18, 2003. 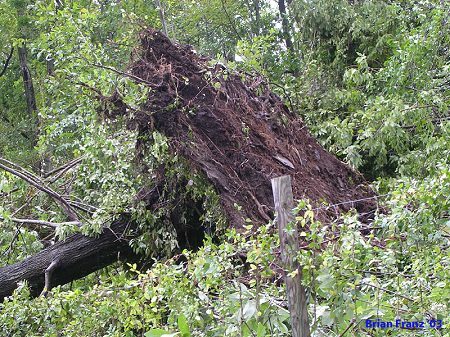 Many trees were toppled throughout the region, but Rapidan Camps escaped with only moderate damage. A tree fell on the springhouse, damaging it, and huge quantities of natural debris were scattered around camp. We also lost electrical power for five days. The damage was much less severe than when Hurricane Fran passed through in 1997. Brian Franz visited camp the day after the hurricane, and took these photos, and retains copyright to them. Fallen trees blocked the road to camp in numerous places. 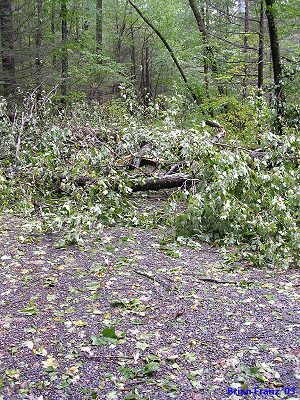 Tony Allen reported that he spent several hours clearing the road to camp of fallen trees. 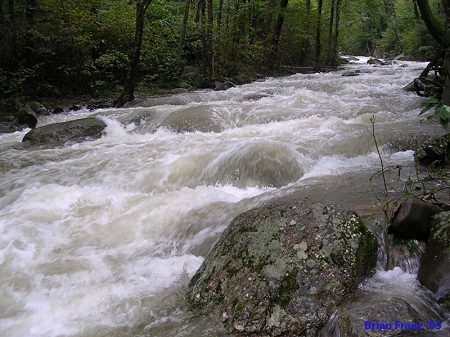 The Rapidan River flowed at extremely high levels. This was the river just below camp. Many trees were toppled, but none fell onto our cabins. Far more trees would likely have fallen if we had not attentively removed the hemlock trees as they died from the Adelgid blight.